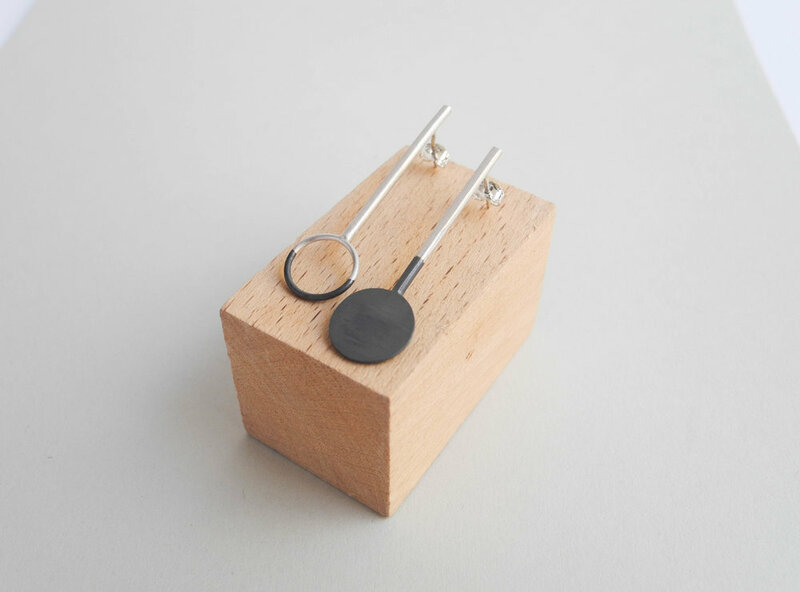 I continue working on the small collection of earrings inspired by Bauhaus style and esthetics. This week, I did more sketches, some quick models with cardboard, and some 3D representations in the computer. Doing physical and digital models is not as fun as seating down in the workshop but it is a lot cheaper and time-saving. It is a necessary step in my design process. I am not tidy when drawing on my sketchbooks, and never been. I take my pencil and make marks on paper. Sometimes trying to express a tridimensional idea I have in my mind, others just designing while I draw. When I do models, it is not my head but my hands that are thinking. I take materials and put them together, try compositions, cut, pin, color, join, reconfigure, reassemble. It is fun and quick. It is cheap and most of the times it can be done with upcycled materials so there is no fear of failing. Indeed, that is what this stage is for: Trying many things out! Mistakes are part of the process and sometimes they reveal things I wouldn´t have imagined. 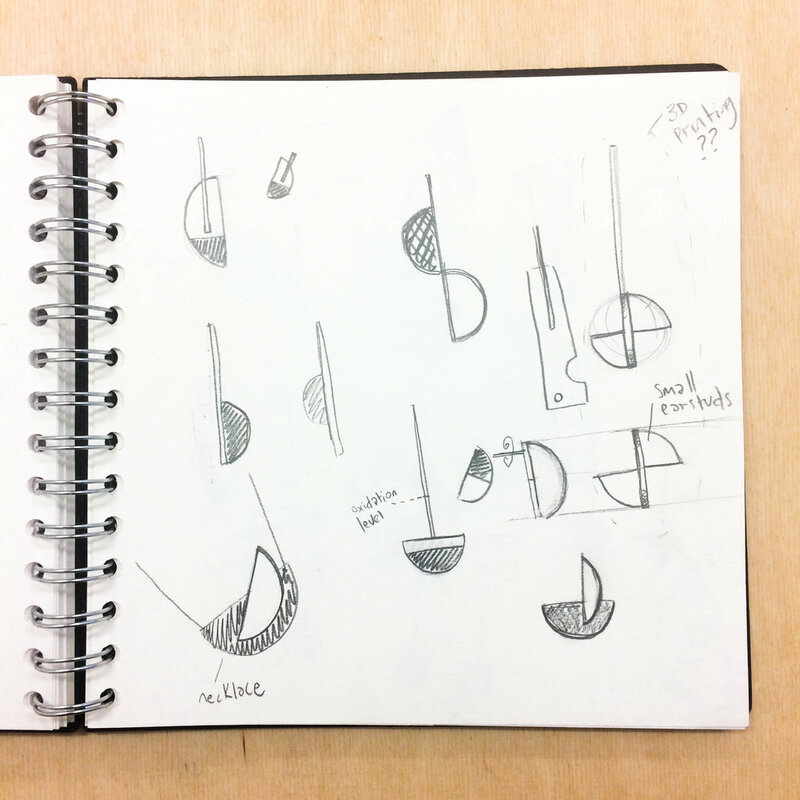 By making quick, cheap models I explore thoughts that are unpremeditated and non-linear. Sometimes 2D representations look a lot nicer than the product will look in reality. 3D modeling is important in the design process because it is realistic, easy and quick. It is like putting out a tridimensional idea from my head and being able to see it straight away exactly as it will look in reality. When working with a client, it is the best way of sharing ideas, as there are no interpretations: a realistic image speaks for itself. In 2017, I designed a line of jewelry inspired by Bauhaus style having primary colors and elementary shapes at its core. Since then, I have been selling my jewelry at Bauhaus Museum shop in Dessau and Tel Aviv. It is now time for adding new products and continue to grow the collection of minimalist, geometrical, anti-ornamental jewelry. The following weeks, I will be working on a small collection of earrings to add to my Elementary Collection. I always loved the simplicity of all Bauhaus objects. I will keep that in mind to create jewelry that is simple and yet has an expressive spirit. I will be sketching and trying things out before coming up with the final designs. I will use different resources and materials to do models and build some silver prototypes. I will share the process with you here.